A bill that would have allowed local jurisdictions to ban cannabis deliveries originating outside their jurisdictional borders, was defeated in its first committee hearing today after cannabis activists and industry representatives objected to the bill. In introducing the bill, Asm. Cooley noted that he has been involved in both cannabis and local control issues for many years, citing his success as mayor of Rancho Cordova in enacting a local tax on cannabis businesses (however, that tax is overly high and was objected to by Cal NORML). Several times he referred to locals getting past a "parade of horribles" and tried to argue that passing the bill would somehow encourage locals to license cannabis businesses. He conceded that Prop. 64 allowed locals to ban adult-use cannabis businesses, not medical ones. Amy Jenkins of the California Cannabis Industry Association testified that the CCIA must "sadly and regrettably" oppose. She gave statistics on the abysmal failure of local jurisdictions to license an adequate number of cannabis retail outlets as the reason that delivery access must be permitted. Ellen Komp of Cal NORML and Sabrina Fendrick of Berkeley Patients' Group challenged Asm. Cooley's assertion that patients who required access would be able to grow their own, citing restrictive local cultivation ordinances, the lack of renters' rights, and the inability for disabled patients to grow their own. After the public testimony, Asm. Grayson (D-Concord) spoke first, saying that while he is in favor of local control, he wouldn't be able to support the bill because delivery is necessary for those who need cannabis. "No doubt that my mother would be alive today had she had access," he said. "I thought delivery allowed people to have access when locals banned storefronts." Asm. Eggman (D-Stockton) then spoke up, saying, "I don’t think you can take something away from people after you have provided access." Noting she is also a veteran, she mentioned the opioid crisis as a consideration. Asm. McCarty (D-Sacramento) then chimed in saying he could not vote for the bill, noting that while Sacramento was "killing it" bringing in tax revenue from licensed dispensaries, people were driving as much as 100 miles to those dispensaries, and many don’t have access to transportation. "By having more jurisdictions shut it down, it just means fewer tax dollars coming into California and perpetuates the illegal market," he said. Voting No were Assembly members Bloom, Chen, Cunningham, Eggman, Gloria, McCarty, and Ting; Chiu, Dahle, Gipson, Grayson, Holden and Wood abstained. The final tally was 7 in favor and 7 against, with 6 members not voting. In the meantime, 24 cities and the county of Santa Cruz have filed suit against the Bureau of Cannabis Control over its regulation allowing state-licensed delivery services to deliver cannabis statewide. Health-care worker Katelin Noffsinger told a potential employer that she took medical cannabis to deal with the effects of a car crash, but when a drug test came back positive, the nursing home rescinded her job offer anyway. A federal judge ruled in September 2018 that the nursing home, which had cited federal laws against cannabis use, violated an anti-discrimination provision of Connecticut‘s medical marijuana law. It was the latest in a series of clashes between U.S. and state laws around the country that came out in favor of medical cannabis users trying to keep or obtain jobs with drug-testing employers. The Connecticut decision was the first ruling of its kind in a federal case and followed similar recent rulings against employers by state courts in Massachusetts and Rhode Island. Earlier rulings had gone against medical cannabis users in employment cases by state supreme courts, including those in California, Colorado, Oregon, and Washington, over the past few years. “This decision reflects the rapidly changing cultural and legal status of cannabis, and affirms that employers should not be able to discriminate against those who use marijuana responsibly while off the job, in compliance with the laws of their state,” said Paul Armentano, deputy director of the National Organization for the Reform of Marijuana Laws (NORML). Noffsinger sued Bride Brook Health and Rehabilitation Center in Niantic in 2016. She had been offered, and accepted, a job as recreation therapy director at the nursing home, contingent on her passing a drug test. She told the nursing home that she took synthetic marijuana pills — legally under state law and only at night — to treat the post-traumatic stress disorder (PTSD) she developed after the 2012 car accident. But the company rescinded the job offer after the drug test came back positive for THC, the chemical in marijuana that gets people high. As a federal contractor, the nursing home worried that it could be cut off from that revenue if it employed somebody who tested positive for drugs. On Sept. 5, 2018, U.S. District Judge Jeffrey Meyer in New Haven ruled Bride Brook discriminated against Noffsinger based solely on her medical cannabis use in violation of state law. He denied her request for punitive damages. The case is now heading to a trial on whether Noffsinger should receive compensatory damages for lost wages from not getting the job. Noffsinger’s attorney, Henry Murray, said his client would not comment on the lawsuit. He said Noffsinger has taken another job in the health-care industry that doesn’t pay as much as the Bride Brook job. In his ruling, Meyer said the federal Drug Free Workplace Act, which many employers including federal contractors rely on for policies on drug testing, does not actually require drug testing and does not prohibit federal contractors from employing people who use medical cannabis outside the workplace in accordance with state law. 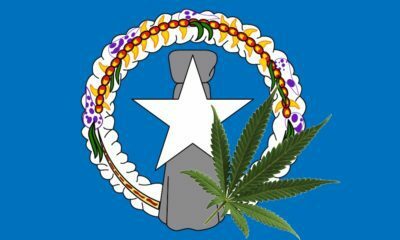 Thirty-one states, Washington, D.C., Puerto Rico, and Guam now allow medical marijuana, while 15 others have approved low-THC products for medical reasons in certain cases, according to the National Conference of State Legislatures. Nine states and Washington, D.C., have legalized recreational marijuana. In Massachusetts, the state’s highest court ruled in 2017 that a sales and marketing company wrongly fired a worker after her first day on the job after she tested positive for cannabis, which she used under the state’s medical marijuana law to treat her Crohn’s disease. Also in 2017, the Rhode Island state Supreme Court said a college student was wrongly denied an internship at a fabric company where officials refused to hire her after she acknowledged she could not pass a drug test because she used medical marijuana. The American Bar Association called the Connecticut, Massachusetts, and Rhode Island cases “an emerging trend in employment litigation” and cautioned employers to consider state medical cannabis laws when analyzing their drug use and testing policies. Several bills are pending before Congress that would undo marijuana’s Schedule I classification as a controlled substance with no medicinal value. But Armentano of NORML said it is unlikely they will go anywhere while Republicans control Congress. Cannabis has been a pressing issue in Oklahoma lately. Earlier this summer, voters approved the legalization of medical marijuana. Since then, the state has been moving fast to implement the new program. As Oklahoma begins the medical marijuana approval process, issuing its first patient licenses, the state has taken a big step toward making medical marijuana a reality. Last weekend was a potential landmark for medical marijuana in Oklahoma. On Saturday, the state’s medical marijuana application system went online. It was instantly flooded with applications from patients, businesses, and caregivers. According to the Associated Press, it was a big first day. In particular, the state received 1,054 applications from patients, 634 applications from business hopefuls, and three more applications from potential caregivers. By the end of the day, the state had received around $1.5 million in application fees. On the same day, the state also started issuing its first round of licenses. Over the weekend, authorities gave licenses to 23 patients. This first small round of licenses was reportedly completed mostly as a way of testing the state’s system for receiving and reviewing applications, and for issuing licenses. If authorities are satisfied with the online system’s weekend performance, they plan to resume issuing licenses this week. So far, the state’s online application portal seems to be working well. By the end of the weekend, state officials reported only a couple of minor errors. The main issue was that people with Yahoo and iCloud email accounts didn’t receive automated confirmation emails. The glitch was apparently fixed quickly. The weekend’s licensing activity was the latest chapter in Oklahoma’s medical marijuana drama. Earlier this summer, voters approved a bill to legalize medical marijuana. Despite winning the majority vote, the bill still faced significant opposition that carried over, even after the vote. In particular, there was a lot of back and forth as advocacy groups and lawmakers attempted to make various amendments and revisions to the medical marijuana program. One of the biggest debates centered on whether or not the state would allow smokable marijuana. Shortly after voters approved the legalization of medical marijuana, there was a surge of voices calling for the ban of smokable cannabis. The Oklahoma State Board of Health actually issued a ban on smokable medical marijuana. The Board said that actual bud or other plant matter should not be allowed in dispensaries. It said it would still allow patients to grow their own smokable cannabis at home. However, Oklahoma Governor Mary Fallin struck down that ban earlier this month when she signed a number of revised regulations. The revised set of rules signed by Gov. Fallin did not include a ban on smokable marijuana. Similarly, the new rules also got rid of an attempt to require every dispensary to have a pharmacist on site. For proponents of medical marijuana, Gov. Fallin’s revisions were important steps to ensure that medical marijuana is accessible to a broad range of patients. Now that the state’s application system is up and running, the state can start officially issuing licenses. Advocates of medical marijuana hope to see marijuana sales begin sometime in the near future. Marijuana legalization is going to be a lead issue in the 2018 elections. Advocating for an end to our decades-long failed prohibition is not only good policy, but good politics. Regulating the adult use of marijuana is currently supported by a majority of Americans from all political persuasions, and any candidate for local, state or federal office would be wise to advocate for the will of the people and make ending prohibition a core plank in their election platform. Supporting sensible reform to our nation’s marijuana laws is not just overwhelmingly popular, it is the economic, scientific and moral thing to do. With nine states having passed adult-use marijuana regulations, and 30 states authorizing medical-marijuana access, issues surrounding cannabis policy have taken center stage in local, state and federal elections. 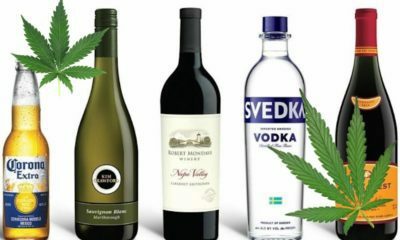 Over 90 percent of Americans support medical-marijuana access, and 60 percent support legalizing and regulating marijuana in a manner like alcohol. If you look back at just the past year, it is clear that if we want the implementation of marijuana-reform laws to succeed, we need to begin voting out officials who are permanently afflicted with reefer madness and replace them with forward-thinking individuals who will fight for rational marijuana policies at all levels of government. With a majority of states now engaging in activities that are in conflict with federal prohibition, it is absurd that House Judiciary Chairman Bob Goodlatte (R-VA), House Rules Chairman Pete Sessions (R-TX) and Senate Judiciary Chairman Charles Grassley (R-IA) refuse to even hold a hearing on this issue. However, it is not just members of Congress who deserve our attention. With ongoing efforts to delay the rollout of legalization and regulation of marijuana in Maine and Massachusetts, mostly at the behest of those states’ governors, we need to push 2018 gubernatorial candidates to take proactive and positive stances on marijuana policy. If you look to New Jersey as an example, which recently saw the exit of anti-drug zealot Chris Christie and the election of pro-legalization Phil Murphy, you can see the positive impact of having a reform-friendly governor on the tenor of the debate. Already, the state is moving to expand and reinforce its long-suffering medical-marijuana program, and Murphy’s election catapulted the topic of full legalization to the top of this year’s legislative-priorities list. There are a number of races this year that are worth watching from a marijuana-reform perspective. In Texas, the opportunity to replace Senator Ted Cruz with pro-legalization Beto O’Rourke would add a new, outspoken supporter to the US Senate. In California, there is an outside chance that Democratic Senator Diane Feinstein, who long opposed our efforts despite the vast majority of her party now being in support of reform, could be ousted by current California Senate President Kevin de León, who has a far better record on cannabis issues. Also of incredible importance are the many gubernatorial elections being held, particularly in Maine, where the current governor (and ardent prohibitionist), Paul LePage, will be term-limited out of office. Governor LePage has spent every day since the 2016 election working to slow down or outright prevent the implementation of his state’s marijuana-legalization initiative. We need to ensure that whoever takes the position after him is progressive and aggressive in implementing legalization. Even on the local level, these elections have a huge impact. In Easton, PA, an effort to decriminalize marijuana failed in the past month due to just one vote, and counties in states that have legalization are often empowered to “opt-out” of allowing retail marijuana outlets in their jurisdictions. Local politics, in many ways, matters just as much if not more than what is happening at the federal level, and reform supporters need to be just as diligent in lobbying their local officials and candidates as those at the top of the ballot. With the clock ticking down to Election Day, get informed, be sure you are registered, and go out and “smoke the vote” this November. A statewide study in California has found that cannabis use by teens in the state has declined. Results of the California Healthy Kids Survey were released by the California Department of Education on Monday. The study is funded by the state’s health and education departments and is conducted every two years. According to the research, 4.2 percent of 7th graders reported that they had used cannabis at any time between 2015 and 2017. That figure represents a 47 percent drop from the last survey when 7.9 percent of 7th graders reported using marijuana from 2013 to 2015. Among 9th graders, 17.4 percent reported that they had used cannabis at some time during 2015 to 2017. That is a 25 percent decline from the 23.1 percent who reported using marijuana in the previous study. Eleventh graders also showed a reduction in marijuana use. In the last survey, 37.9 percent of high school juniors said they had used cannabis between 2013 and 2015 while this year’s result for 2015 to 2017 recorded a 16 percent decline with 31.9 percent claiming cannabis use. The percentage of teens who had used cannabis in the 30 days prior to the survey also declined. For 7th graders, the figure dropped from 5.0 percent in the last survey to 2.3 percent for the latest one. For 9th graders, the drop was from 13.4 percent to 9.5 percent, and for 11th graders, the number declined from 20.1 percent to 16.7 percent. Will Legalization Affect Future Results? The study’s authors noted that the survey was conducted prior to the legalization of recreational marijuana sales, which began in California at the beginning of 2018. “How the recent legalization of marijuana use for adults in California [affects] the declining trend among youth warrants attention,” they wrote. “The next biennial survey will be of particular interest to shed light on whether the change in state marijuana laws [affects] these findings,” researchers added. Tom Torlakson, the State Superintendent of Public Instruction, said in a press release that educators have a role in making sure that cannabis legalization does not lead to increased use by young people. “We must continue to be diligent in our efforts to prevent, or at least limit, marijuana use in light of the potential effect of the legalization for adults as a result of the passage of Proposition 64 two years ago,” Torlakson said. Ellen Komp, deputy director of California NORML, said in a blog post from the advocacy group that the legalization of recreational cannabis is actually a factor in the decline of use by teens. Komp also said that sound cannabis policy reforms are the best way to keep California residents and their communities safe. “It’s time to stop trying to ‘send a message’ to young people about drugs and instead implement sound, science-based policies that best protect our children and public safety, along with our privacy and human rights,” Komp said. Marijuana festival organizers were banking on this to be their biggest year yet, now that recreational cannabis is legal in California and the state is legitimizing such events by licensing them for the first time. Promoters say they planned to stop operating under the loose protections of the state’s medical marijuana laws, where they’d force attendees to get doctor’s recommendations for cannabis before entering the gates. Instead, they hoped to have licenses that would allow anyone 21 and older to buy and smoke cannabis, just like they can buy and drink beer at other festivals. But with local authorities now able to block such festivals even from the limited venues where they’re permitted by new state rules, there weren’t any state-sanctioned events in Southern California during the first half of the year. And none are on the horizon for the rest of 2018. The picture is a bit brighter in Northern California. The state licensed marijuana festivals this spring in Sacramento and in Santa Rosa, where the massive Emerald Cup is also expected to go off in December without a hitch. You know what they say—a dog is a man’s best friend, unless it’s a police dog that just sniffed out $10 Million worth of his marijuana. Ok, that might not be exactly how the catchphrase goes, but it does pertain to at least one Chicago man who attempted to traffic that amount of marijuana cross-country until he crossed paths with Jayda, a dog with quite the impressive schnoz. So much for police dogs being trained to ignore the smell of marijuana. Although, it’s pretty hard to ignore the smell of $10 million worth of the stuff. On Thursday, Jayda helped Chicago PD confirm their suspicions that a driver from Midlothian, Texas was trafficking drugs from California. According to CBS Chicago, the stop and search was part of a long-standing organized crime investigation. After a quick sniff job, Jayda uncovered over 1,500 lbs of cannabis in the vehicle and attached trailer, as well as a variety of pot products and paraphernalia. The vehicle had just touched down in Chicago before police conducted the search. The man behind the wheel was 42-year-old Jason Tanner of Lakehead, California. According to the local news site, he was charged with possession of more than 5,000 grams of marijuana. The pot had a street value of approximately $10 million. As of Tuesday Morning, the Chicago PD’s Facebook post has gone viral. As it stands, the post has received over 8,000 shares and counting. “Chicago Police Officers assigned to the Narcotics Unit conducted a narcotics investigation which led to a traffic stop of a vehicle suspected in narcotics trafficking. 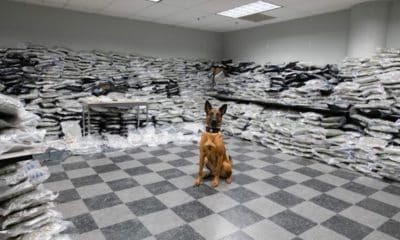 A Police canine alerted to the scent of narcotics and a subsequent search of the vehicle resulted in over 1500 pounds of cannabis products with a street value of over $10,000,000 being recovered. Officers learned that the narcotics were en route to Chicago from California. The driver of the vehicle was placed in custody and charged with Cannabis – Possess more than 5000 grams. On Friday, Tanner’s bail was set at $50,000 for the incident. After being held at Cook County Jail on Monday, Tanner is due back in court on July 10. Chicago Police are currently working alongside Drug Enforcement Administration agents in California to further investigate the ongoing case. However, it’s unclear if Jayda still has her “paws” on this case.